This is the description of the Go API bindings for the Color Bricklet. General information and technical specifications for the Color Bricklet are summarized in its hardware description. const UID string = "XYZ" // Change XYZ to the UID of your Color Bricklet. c, _ := color_bricklet.New(UID, &ipcon) // Create device object. // Set period for color receiver to 1s (1000ms). // Configure threshold for color "greater than 100, 200, 300, 400". If you want to get the color periodically, it is recommended to use the (*ColorBricklet) RegisterColorCallback callback and set the period with (*ColorBricklet) SetColorCallbackPeriod. Returns the configuration as set by (*ColorBricklet) SetConfig. To get a correct illuminance measurement make sure that the color values themself are not saturated. The color value (R, G or B) is saturated if it is equal to the maximum value of 65535. In that case you have to reduce the gain, see (*ColorBricklet) SetConfig. To get a correct color temperature measurement make sure that the color values themself are not saturated. The color value (R, G or B) is saturated if it is equal to the maximum value of 65535. In that case you have to reduce the gain, see (*ColorBricklet) SetConfig. For getter functions this is enabled by default and cannot be disabled, because those functions will always send a response. For callback configuration functions it is enabled by default too, but can be disabled by (*ColorBricklet) SetResponseExpected. For setter functions it is disabled by default and can be enabled. See (*ColorBricklet) SetResponseExpected for the list of function ID constants available for this function. Sets the period in ms with which the (*ColorBricklet) RegisterColorCallback callback is triggered periodically. A value of 0 turns the callback off. The (*ColorBricklet) RegisterColorCallback callback is only triggered if the color has changed since the last triggering. Returns the period as set by (*ColorBricklet) SetColorCallbackPeriod. Sets the thresholds for the (*ColorBricklet) RegisterColorReachedCallback callback. Returns the threshold as set by (*ColorBricklet) SetColorCallbackThreshold. Returns the debounce period as set by (*ColorBricklet) SetDebouncePeriod. Sets the period in ms with which the (*ColorBricklet) RegisterIlluminanceCallback callback is triggered periodically. A value of 0 turns the callback off. The (*ColorBricklet) RegisterIlluminanceCallback callback is only triggered if the illuminance has changed since the last triggering. Returns the period as set by (*ColorBricklet) SetIlluminanceCallbackPeriod. Sets the period in ms with which the (*ColorBricklet) RegisterColorTemperatureCallback callback is triggered periodically. A value of 0 turns the callback off. The (*ColorBricklet) RegisterColorTemperatureCallback callback is only triggered if the color temperature has changed since the last triggering. Returns the period as set by (*ColorBricklet) SetColorTemperatureCallbackPeriod. A callback can be registered for this event with the RegisterColorCallback() function. This function returns the ID of the registered callback. An added callback can be removed with the DeregisterColorCallback(callbackID uint64) function. This callback is triggered periodically with the period that is set by (*ColorBricklet) SetColorCallbackPeriod. 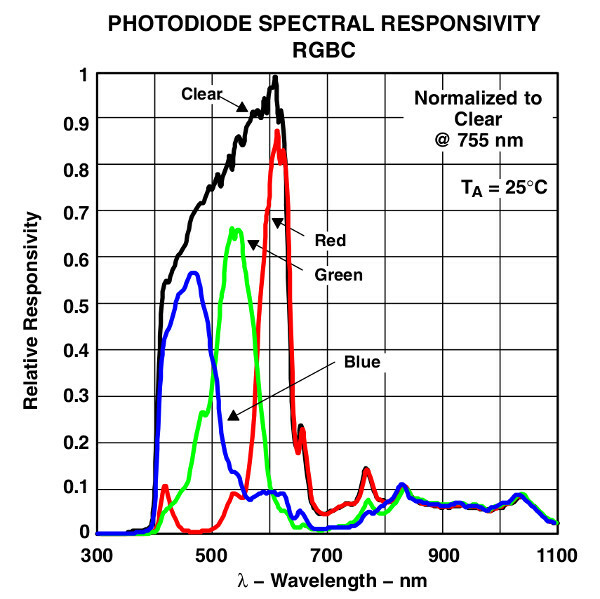 The callback parameter is the color of the sensor as RGBC. A callback can be registered for this event with the RegisterColorReachedCallback() function. This function returns the ID of the registered callback. An added callback can be removed with the DeregisterColorReachedCallback(callbackID uint64) function. This callback is triggered when the threshold as set by (*ColorBricklet) SetColorCallbackThreshold is reached. The callback parameter is the color of the sensor as RGBC. If the threshold keeps being reached, the callback is triggered periodically with the period as set by (*ColorBricklet) SetDebouncePeriod. This callback is triggered periodically with the period that is set by (*ColorBricklet) SetIlluminanceCallbackPeriod. The callback parameter is the illuminance. See (*ColorBricklet) GetIlluminance for how to interpret this value. A callback can be registered for this event with the RegisterColorTemperatureCallback() function. This function returns the ID of the registered callback. An added callback can be removed with the DeregisterColorTemperatureCallback(callbackID uint64) function. This callback is triggered periodically with the period that is set by (*ColorBricklet) SetColorTemperatureCallbackPeriod. The callback parameter is the color temperature in Kelvin. The (*ColorBricklet) GetIdentity function and the (*IPConnection) RegisterEnumerateCallback callback of the IP Connection have a deviceIdentifier parameter to specify the Brick's or Bricklet's type.